Computing has had a dramatic impact on the discipline of linguistics and is shaping the way we conceptualize both linguistics and language. 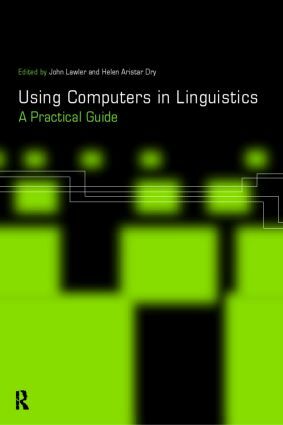 Using Computers in Linguistics provides a non-technical introduction to recent developments in linguistic computing and offers specific guidance to the linguist or language professional who wishes to take advantage of them. Divided into eight chapters, each of the expert contributors focus on a different aspect of the interaction of computing and linguistics looking either at computational resources: the Internet, software for fieldwork and teaching linguistics, Unix utilities, or at computational developments: the availability of electronic texts, new methodologies in natural language processing, the development of the CELLAR computing environment for linguistic analysis. John Lawler is Associate Professor of Linguistics at the University of Michigan and Director of its undergraduate program in Linguistics. Helen Aristar Dry is Professor of Linguistics at Eastern Michigan University, and is co-founder and moderator of The LINGUIST List, a 9000-member electronic discussion forum for academic linguists.